colour print from woodblocks, Oban format, 1858. 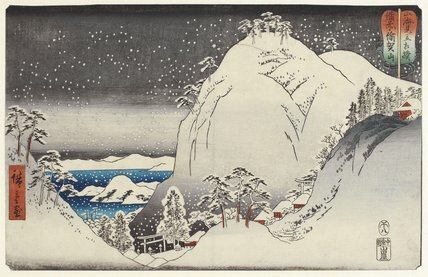 Signed: Hiroshige ga. Publisher's seal: Yamadaya (Yamadaya Shojiro). Mount Yuka in Bizen Province (Bizen Ukazan). From the series Sankai Mitate Sumo (Sumo Bouts Between Landscapes and Seascapes).